Christian Sanguineti has joined Camfil Australia Pty Ltd as the new Queensland business development manager. He is responsible for building the market for Camfil APC dust and fume collection equipment in Queensland. Key applications for the equipment include bulk powders/ materials handling throughout the state as well as general industrial and mining dust control. To help acquaint customers with the company’s line of Farr Gold Sold Series® dust collectors, Sanguineti has a mobile trailer that can be used to visit facilities throughout Queensland to conduct training, education and onsite product demonstrations. He will be based in the Camfil Richlands office. Sanguineti brings more than eight years of dust control experience to the job. 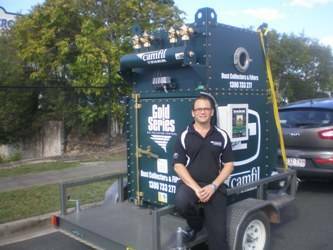 Prior to joining Camfil Australia, he worked with MARC Technologies, a distributor of dust collection equipment. In his new post he reports to David Higgins, air pollution control general manager of Camfil Australia.